The Month in Theydon (February): Trevor Roberts latest report is on line Click Here. THEY ARE BASED IN THE COMMUNITY BEAT OFFICE LOCATED AT DEDBEN UNDERGROUND STATION. THESE OFFICERS ARE RESPONSIBLE FOR THE CENTRAL LINE FROM EPPING TO SNARESBROOK STATIONS. ANY INFORMATION OR CONCERNS THAT YOU HAVE REGARDING THEYDON BOIS STATION PLEASE CONTACT THE ABOVE OFFICERS. IN ANY EMERGENCY PLEASE CONTACT POLICE IN THE UNUSUAL WAY BY WAY OF 999. THESE OFFICERS CAN BE CONTACTED ON THE FOLLOWING NUMBERS. Theydon Bois & Abridge Action Group: This is the full text of the article by TBAAG that appears in March Village News, but which had to be abbreviate there because of space reasons. The recently formed Theydon Bois & Abridge Action Group came into existence to help bring further pressure to help protect the Green Belt, the Environment and the Wildlife of Theydon Bois and Abridge. The Theydon Bois and District Rural Preservation Society normally addresses these issues for our village, but the major threat of the development of the Golf Course at Blunts Farm found us finding common cause with the residents of Abridge. Their lives like ours have been blighted by continuous heavy lorry movements of up to 300 a day six days per week, and it was felt that a group comprised of people from both villages would be more representative and could spend more time on this specific issue. The Theydon Bois & Abridge Action Group TBAAG and TB&DRPS have all been bringing further pressure on EFDC over recent months over the continued waste dumping on the Blunts Farm Site. The Environment Agency withdrew the site's Waste Exemption Certificate on 12th January and EFDC voted unanimously on 17th January to issue an Enforcement Notice and or Stop Notice. Blunts Farm Estate Limited have now appealed the Enforcement Notice and a public enquiry by the Planning Inspectorate will probably ensue. The Enforcement notice can only ensure one of two things, that the land is returned to its original state or that the original planning permission is complied with. TBAAG wishes to highlight concerns with the planning process at EFDC that has created the problem at Blunts Farm, and has requested that EFDC hold an enquiry into their planning processes. We have requested this be an independent, open, and transparent inquiry. EFDC have now confirmed to TBAAG that the appropriate organization to investigate the complaint would be the Commission for Local Administration in England, the Local Government Ombudsman. We have contacted the Ombudsman saying would welcome a review of procedures in the Planning Department, which would identify any malpractice, irregularities or lack of professional judgment with particular regard to Planning Application EPF/765/99 (Blunts Farm Estates Ltd). We are requesting that as a result of this enquiry, any employees or officers found responsible for malpractice should be made accountable. TBAAG are further requesting that any Planning Applications of this scale, which may impact on Theydon Bois and Abridge as a whole should be effectively and widely communicated to both villages. More than an announcement in the newspaper and contacting just a few households adjacent to the site is needed. A much greater number of households should be written to directly and plans should be made available at both Village Halls for examination for a period of at least one month. We are also asking that on developments of this scale, that a substantial 'bond' should be secured from the developer to ensure a positive completion. This will help prevent a developer 'walking away' from them without completing and leaving us with the scars on our landscape. Currently we are also concerned with the safety of this site due to the deep water filled pits. Particularly to inquisitive children and walkers that may stray from the footpath. We are requesting that protective measures are put in place to make the site is made safe with immediate effect. If you are also concerned about our villages, feel strongly about this issue and want to help, get in touch. TBAAG meet regularly once a month and would welcome new members from the villages of both Theydon Bois and Abridge. jacq.dodman1@btinternet.com or call 01992 813304 or 07976 222774. Cricket Club Looks Forward To New Season: Theydon Bois Cricket Club is looking forward to the new season with confidence as they look to defend their title of 1st Division Champions of The Herts & Essex Observer Cricket League. The Club powered their way to the title last year with some impressive batting performances which saw them win an amazing fifteen matches out of an eighteen match league campaign. If you are interested in cricket and would like to become a member, either as a player or as a social member, then the Club is always interested to hear from you. Further information on Theydon Bois Cricket Club can be found on their web site at www.tbcc.co.uk or contact the Club Secretary. Rhythm Time Classes: have been running in the Village Hall on Thursday mornings since September. The classes, which are an ideal introduction to music for the under 3s, are growing steadily, so if you'd like to book a place for your baby or toddler give Ingrid a call on 01992 611995. January Parish Council Minutes: The full minutes of the Parish Council meeting for 26th January are now available. Click Here. New Allotment Charges: The re-generation of the Allotments has continued with the clearing out of old metal, dead wood and rubbish from the hedge line between the Buxton Trust field and the Allotments. We have purchased some new Quickthorn hedging and planted the saplings along the boundary as well as erecting a new galvanised pallisade fence to the rear of the Cricket Pavilion , with funding for it shared between the Parish Council and the Buxton Trust. ( in view of recent events with the Youth Centre Public Inquiry the maintenance of boundaries is ALL important). 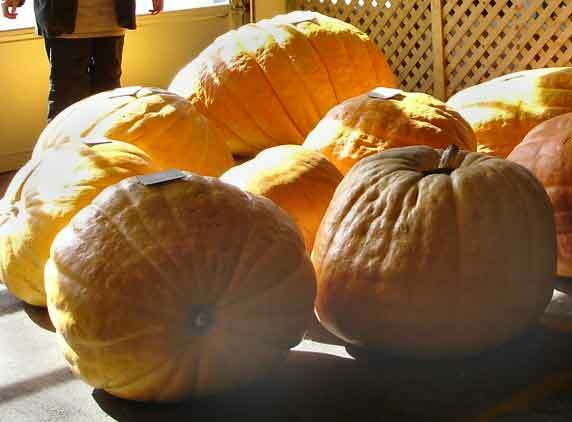 The annual Allotment holders meeting was recently held where the atmosphere was both positive and constructive. During the year we have found a single furrow plough from the Didlington Nursery at Swaffham, transport back to Theydon provided by Roy Gordon, and with the kind help of Robin L. Jones and his tractor we have managed to plough a number of plots on the site as requested. In the past the biggest drawback for many people not to have a piece of ground was the physical labour involved in preparing the area particularity from a grass/weed surface. In order to reduce this problem we have taken the decision to split one large plot into three smaller pre-ploughed segments which will hopefully appeal to and encourage a wider audience. Already the number of plots taken up has increased and there is a much greater sense of community on the site. To support the renewed interest we have sourced from Woodredon Riding Stables composted manure at £10  a transit load which is delivered and tipped by the plot. It has also been agreed to create a turning circle made from road planings by the entrance gate which should be completed by early summer, reducing the need for vehicles to be towed out of the quagmire ! We also look to plant some Oak Memorial trees along the top north eastern boundary , where there are three existing oaks which were dead wooded in the past year, and perpetuates the wish of Lord Buxton to maintain oaks along this boundary. There is no charge for water. I would like to take this opportunity to thank Paul Argent and John Mynot for all their hard work as well as many others who have helped in the re-generation of Theydon Bois Allotments. If anybody is interested in taking on an Allotment please call the Parish Clerk on 01992 81 3442. A Strong Opinion on some Dog Owners: As a relative newcomer to the Village of three years, I am completely baffled and furious by the lack of respect a handful of dog-owners obviously have for other residents. I live in Morgan Crescent and am a mother of a 3 and 6 year old. I have lost count of the number of times I've had to tell my children to watch out for the dog mess on the way to school. My 3 year old has walked into it outside our house and more recently, an owner has allowed their dog to foul directly outside the school gates. Dog mess is not just a nuisance, it VERY dangerous. It can carry all sorts of parasites and can cause blindness in children. Bearing in mind that young children spend time during their school day, sitting crossed legged on the floor; it doesn't take a lot of thought to see how dog faeces can easily be transferred from hands to mouths and eyes. It's not just the pavements either. A walk to the forest recently was short-lived because my daughter walked into yet more dog mess. When we moved here, I never thought there would be a problem like this; even the London Borough we moved from didn't have such a problem locally. I really thought people in a Village would be far more considerate of others. Perhaps dog owners need reminding that it's actually an offence and carries a fine of up to £1,000. I'm sure the criteria for a 'Best Kept Village' doesn't just constitute hanging baskets and a litter collection the first Saturday of the month. Do you agree. See below. Loughton 150: In August 1856 the Eastern Counties Railway opened their branch line to Loughton in what was then very rural Essex. Celebrations of the 150th anniversary will take place this summer in Loughton when vintage tube trains are expected to run to and from Loughton and Epping. Loughton and District Historical Society will also publish a book to celebrate the 150th Anniversary of the Loughton Branch. There will be a short general introduction, giving an overview of the branch during its 150-year history and then 'Early Proposals for Railways in the Loughton Area' will be discussed. 'The Railway and its Effect on Loughton' will show how the development of Loughton was stimulated by the railway and how the decisions of the ECR/GER management determined the social make-up of the town. There is then a review of complaints that were received in the early days and a passengers' rebellion is noted. This is followed by a brief history of Loughton's three stations, from the wooden ECR terminus on the site of the present Lopping Hall in Loughton High Road to the later station built as a result of the extension to Epping and Ongar and its 1940s replacement. A seminal essay from the book on Loughton's first station is reprinted as is also a piece on the Recreation Ground, for the use of excursionists to Epping Forest, which was adjacent to the early station . 'Debates on Platforms' reprints an article which appeared in the Society's Newsletter in 1993, speculating on the arrangements for the staggered platforms and crossings on the branch in its early days, and a reply to this article published at the time. The opportunity has been taken to bring the information up to date. 'Engines, Engineers and Rolling Stock' tries to determine what was used on the railway from the early days to the present and who was responsible for it. Also included are details of some incidents that occurred on the branch. 'The Past in the Present' lists what can be seen from the window relating to the history of the branch on a journey undertaken today. Finally there is a short biography of Edward Johnston, the designer of LT's typeface, Johnston Sans, and creator of the LT roundel or target logo. The book will also have plans, maps and historical photographs. The aim has been not to write a technical railway book but a general history including as much information about the personalities involved as can be obtained. Locomotive engineers involved on the line and Horatio Love, chairman of the ECR and GER, and others, have potted biographies in the notes at the end of some of the articles. The book will be about 100 pages A5 and should publish in late spring. A copy can be reserved from the LDHS website www.loughtonhistoricalsociety.org.uk or by post to Loughton 150 Book, 34 Hornbeam Road, Theydon Bois, Epping, Essex CM16 7JX, giving name, address, telephone number and/or e-mail address. Pre-publication price will be £7. The book will probably be published at £8.50. No money should be sent now. When copies are available people who have reserved a copy will be contacted and on receipt of payment, the book will be sent. On the 22nd of February an Oak tree was planted on the Green to commemorate the 200th Anniversary of the Battle of Trafalgar. The tree had not been planted at the time of our Village Trafalgar Day Commemoration as conditions were not suitable at that the of year. 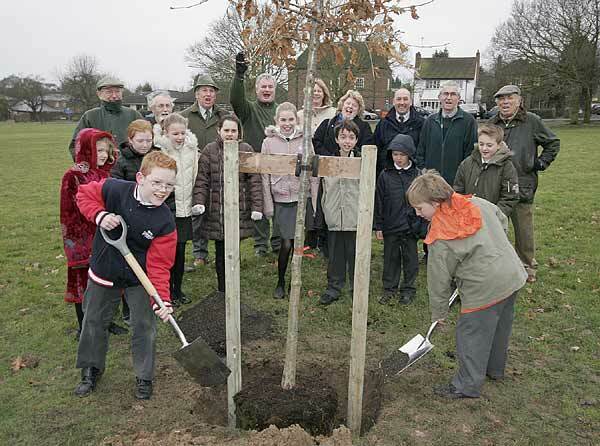 Pupils and staff from Theydon Bois Primary School planted the tree with help from EFDC Countrycare and were joined by representatives from the Parish Council, Rural Preservation Society and other villagers at the ceremony. The event was organised by Epping Forest District Council Parks and Leisure Services together with our Parish Council. Save the Youth Centre Enquiry & Petition: As noted below the Public Enquiry into the redevelopment of the Youth Centre site took place on the 31st January & 1st February and has now closed and will not be accepting further submissions. It was good to see large numbers of people attending the from the village, with a very high attendance on the first day. We feel we have made a very strong case as to why the appeal by Essex County Council should should not overturn the refusal by EFDC of the planning application and allow residential housing on the site. District, County & Parish Councillors, Youth Initiatives Committee Members, TB Preservation Society, Theydon Parents Group and Individual members of the public all cross-questioned Essex County Councils witnesses, sometimes with very telling effects. It could be a close run result, but we are hopeful that given the evidence we brought forward the inspector will find in our favour. The Inspector's decision is expected to be issued on or before 31st March 2006. The group produces a web-based newsletter and aims to use the e-mail and Internet to ensure that parents and grandparents in the village are up to date with any developments affecting our children and young people. Month in Theydon (December): Trevor Roberts latest report is on line Click Here. Blunts Farm Enforcement Action Decision: At the District Development Control Committee meeting on Tuesday, 17th January 2006 councillors unanimously agreed that EFDC should take the enforcement action against Blunts Farm Estates recommended by officers in the Supplementary Report to the agenda, with the exception of item 9.7, which would have given council officers the right to withdraw any enforcement notices without reference back to the councillors committee. Planning Officers will now be required to do this. A packed council chamber saw clear graphic evidence in the contour maps shown that tipping on the site has been excessive. The present present excess spoil is estimated at 200,000 cubic meters or 20,000 lorry loads. The enforcement action can only require that the developer ceases to import soil within 7 days and then either complete the Golf Course as in the original application EPF/765/99 or restore Blunts Farm to the original levels within 2 years. Concerns were raised that to achieve this may require up to 20,000 further lorry movements to remove the spoil from the site causing further nuisance to Theydon & Abridge villagers. It may be possible to reach a negotiated compromise settlement with the developer that satisfies all parties, but at this stage it is quite likely that the developer will appeal the decision. It was pointed out that a successful legal challenge could cost the authority £1.6 Million, but councillors agreed that the disruption of the lives of people living in the area had gone on for far too long. The council itself could also be the subject to an ombudsman enquiry if they failed to take action. At present tipping has already been stopped at the Blunts Farm site as of Thursday 12th January because the Environment Agency has withdrawn the site's exemption from having a waste tipping license. This is while it further investigates the material imported and effects of tipping at the site. Barry Land for EFDC planning department said that because of this the enforcement against further tipping will only be served when/if this exemption is reinstated. TBAAG, many of whose members were in the chamber to see the decision, said they that while they were at last pleased to see an end to the tipping and the destruction of the Green Belt it had taken far too much effort from people in the district and far to long to achieve this. We now have the situation where we have 200,000 cubic meters of excess waste, which if it is to be removed will further disrupt the lives of villagers. If EFDC reach any decision with the developer they should make sure it is one that cannot be abused and ensure that it causes the least possible further nuisance to people in the district. A spokesperson for Theydon Bois and District Rural Preservation Society said following the decision to take enforcement action they had written to John Preston the Head of Planning at EFDC because they were very concerned about a still an outstanding planning application for the site. This application EPF/1363/05 seeks to further extend the Golf Course from the original application EPF/765/99 and re-contour and realigned the whole of the course. If this application were allowed the developer could claim that the final contours of the course are not finished and therefore there will be no excess material in the original area (the only one to which the enforcement action applies) when these final contours are achieved. Indeed he could claim that is why he still needs to import material under the original application to get to these levels. We also pointed that out in our submission of 23rd August 2005 that we were concerned that the Supplementary Document for Golf Courses, that is now required, is so poorly drafted that it still does little to prevent a devious developer from importing "spoil or waste" under the guise of materials. We think most people (as was pointed out at Tuesday's meeting) would not want to see a further 20,000 lorry movements removing the waste from the site and therefore to using some or all of the present excess only, with proper safeguards, on the extension may be a solution, but to grant EPF/1363/05 in anything like its present form is full of dangers. We think that EFDC's position would be strengthened if this application was now refused at the earliest opportunity. NEW TREES IN THE VILLAGE: Under the Theydon Bois Community Tree Strategy Scheme we have now completed the planting of the new trees for the 2005/2006 planting season. In liaison with the District Council and Country Care (EFDC), who provided 7 of the trees a further 12 were paid for locally - 8 of which are Memorial trees donated by residents in memory of loved ones. We are most grateful for this support, the balance of funds being paid by the Parish Council. There is a plaque displayed in the Village Hall which displays details of those who have contributed for a Memorial Tree. We are very pleased with the quality of these trees that included Rowan, Hornbeam, Pyrus, Cherry and Birch, all of a type suitable for road verges and planted with root barriers and watering tubes. The Strategy extends over a 5 year period - it is proposed that the committee will meet later this year for the annual review and decide on our programme for the following year. We shall do our best to continue to enhance the Village for the benefit of our residents. Theydon Bois Tree Strategy is under the auspices of Epping Forest District Council, Theydon Bois Parish Council, Theydon Bois Rural Preservation Society, Theydon Bois tree wardens and the Corporation of London: Conservators of Epping Forest. If you are interested in having a memorial tree planted during the 2006-2007 season please e-mail or write to the Parish Clerk at the Parish Office, Village Hall, Coppice Row, Theydon Bois, Essex CM16 7ER. Theydon Bois & District Rural Preservation Society Walks: Do you get out much? Do you know the forest and fields on our doorstep? Are you nervous of walking in the woods on your own? Are you new to the village and not sure how to explore your new surroundings? The Society has the answer! Join us in discovering (or rediscovering) the delights of our local countryside on five Sunday afternoon walks, each of about four miles. The walks will start from the Village Hall at 2 pm. and last about two hours. This year the walks will be on the first Sunday of April, May, June, July and September - that's easy to remember! May 7th An Iron Age Fort - swords optional! June 4th Rhododendrons and sweet chestnuts. September 3rd Around the village boundary. Walks marked with an * have stiles to be negotiated. All these accompanied walks are free. Stout footwear is advisable as the ground can be uneven and/or wet and muddy. Long trousers will protect against brambles or stinging nettles. Blunts Farm Enforcement Action: The Agenda for the District Development Control Committee meeting on Tuesday, 17th January 2006 (see item below) together with the supplementary agenda with regard to Blunts farm has now been published by EFDC and are available as hard copies from the Civic Offices in Epping or you can download the Supplementary PDF by clicking on the link HERE . The document is only 61k and should download in less than 30 secs on a 56k modem, but it is 20 pages long so we suggest that you right click and select "Save Target As" so that you can save it to your hard disk and print it out or read off line. The conclusion (sec. 8) and the recommendations in to the councillors (section 9) make it seem promising that EFDC will take some action at last to end this nonsense. TBAAG are still recommending that as many people as possible turn up to the meeting, at 7.30pm on Tuesday night in the council chamber at the Civic Offices in Epping, so as to demonstrate to councillors the strength of feeling on this issue. We hope then to see the right result. Theydon Bois & Abridge Action Group: are still protesting about the 300 lorries a day that have been dumping waste on the Parsonage Golf/Blunts Farm site. They are trying as best as possible to publicise and raise awareness about this issue so as to bring it to an end. You may have recently seen articles and letters in the local press. It has been reported to TBAAG that it it possible that some of this waste may be hazardous. It was causing a putrid smell in the area a few week ago, which may explain why some people in the village were claiming they were feeling sick or ill. You may also have noticed the large numbers of seagulls that are hovering over the site. The Theydon Bois & Abridge Action Group (TBAAG) say they are concerned about the possible health risks,as well as the increased number of accidents which have occurred near the entrance to the site. In addition is the extensive damage to the roads and debris on the roads, which is being left by overloaded lorries. EFDC has just recently granted the application for the club house on the site of this Golf Course, but have yet to make a decision about the application to further extend and re-contour the whole of the course site. With this in mind we can't see this "golf course", which is still currently a landfill, as it has been for the last 6 years, being completed for even more years. Unless something is done Theydon and Abridge residents will continue to have to put up with this intolerable nuisance and blot on the Green Belt landscape. In addition to the planning application for an extension to this "18 hole golf course" TBAAG believe further applications may soon be forthcoming from the developer, a tennis academy with carparking has already been rejected on the Green Belt land near to the station. If you feel strongly about the above issues the TBAAG asks for your support by attending the next District Development Control Committee Meeting at the Civil Offices, Epping Forest District Council, on Tuesday 17th January 2006 at 7.30 pm when Blunts Farm is on the agenda. TBAAG ask that if you feel unwell or sick and feel that the above site may be the cause, or if you are unhappy about the potential developments and the impact they will have in your village, act as soon as possible. TBAAG want to encourage as many people as possible to write to the EFDC committee before Tuesday's meeting about the abuses that they feel are taking place at this site. At present four Hugh pits (each deep and wide enough for a couple of two storey houses) have been dug on the site. You can visit the Parsonage Golf site yourselves and see some of what is happening by crossing the site keeping to the public footpath that runs across it from the back of Theydon Bois station. For further details about TBAAG, please email: jacq.dodman1@btinternet.com or telephone: 01992 813304 or 815846. It is very important that as many residents as possible attend so as to demonstrate to the enquiry inspector the strength of feeling against the closure of the club by Essex County Council, which deprives our youth of the essential facility. Please try to spare some time to come along on one or both of the days to show your support or ask questions. In particular we still need Pictures of activities that have taken place on the field adjacent to the new Youth Centre over the last 40 years . Also if anyone has tried to hire the Youth Club from Essex at any time, please provide us with a statement and or letters if you have them . Please get in touch with the Parish Clerk with any information. Theydon Residents raise your voices . OBJECT!!!!! Parish Council Dates: A full list of all the Parish Council Meeting dates for 2006 is now available and the list of Parish Councillors and their responsibilities for 2006 has been up dated. Volunteer distributors still needed for the quarterly editions of the Village News. If you would like to help please call Madeleine or sharon at the Parish Office on 01992 813442. The Month in Theydon (November): Trevor Roberts latest report is on line Click Here. Village News December: The pdf version of the December 2005 issue of Village News (No. 52) is now available to download. Click Here. Just to let you know we have received a Highly Commended Certificate of Merit Award from the Rural Community Council of Essex for our Village News. We received 43 points out of a possible 50 with some glowing comments. (What you have to do to win it I don’t know!). They offer congratulations to all involved in producing the magazine. Parish Council Minutes: The minutes of the November Parish Council Meeting are now on line Click Here. News in Brief: The Parish Council are pleased to announce the appointment of Mrs Sharon Surridge as Assistant to the Parish Clerk. After a period of training it is intended that Sharon will work in the Parish Office on a Tuesday and a Friday morning. Madeleine Murphy, the Parish Clerk will be in the office during the other week day mornings and attend most of the evening meetings. The local school would like to thank those residents in the village who have donated their Tesco vouchers to the school. New Trees in the Village:Theydon Bois Tree Strategy Committee has arranged for a further 20 trees to be planted in the village roads for the 2005 winter planting period, some of which may have arrived as we go to print. This work is carried out in co-operation with EFDC Parks Dept. and funded partly by District Council and the remainder from village funds provided by those residents who have very kindly donated for a Memorial Tree, the Parish Council and the Preservation Society. Upright Hornbeam, Cherry(not fruiting!!) and Birch . this is the third year we have carried out the planting programme under this scheme and we are grateful for the support we have received to enable this to be achieved. The Annual Meeting of the T.B. Tree Strategy took place on 6th October 05 in the Village Hall. This was attended by Epping Forest District Council, Corporation of London (Epping Forest), Parish Council representatives from T.B. Rural Preservation and Horticultural Societies also our village Tree Wardens. maintenance of the Village Green, works carried out to The Avenue of Trees and discussion on further work needed. Our concern was expressed in regard to new pavement cross-overs for cars that have resulted in green verges and trees being removed, also discussed were foot paths, the possibility of planting an oak tree as part of the Trafalgar Day Celebrations and the continuing problems with Parsonage Golf Course. The meeting concluded with a discussion on our plans for the next year of our 5 year programme. Wilfred S Shales: We were sadden to learn of the death of Wilf's wife at the beginning of this month while Wilf was in hospital, where he remains awaiting a heart by pass operation. We wish him a speedy recovery and our thoughts are with him at this sad time. Buxton Trust Awards: Buxton Trust Playing Field entered The Best Kept Playing Fields Competition, organised by Essex Playing Fields. the year. This was for the new roof on the Cricket Club pavilion. enter the competition next year. Possibly in another two classes. The President, Capt. D. Gwynne-James announced that for the first time Essex County Council had agreed a grant ( £7000 ) to Essex Playing Fields. given, to make the ground a pleasure for everyone. Are you interested in being part of a Theydon Parents group? : A number of parents in the Village are considering starting up a Theydon Parents Group to represent the interests of children and young people in the village. We intend to start a type of organisation, which will create a database of village parents allowing the group to be consulted and informed about issues affecting children and young people. The group will listen to the opinions and views of parents and actively represent the interests of our children and young people at events where they need their voice and views to be heard, such as public meetings, consultations and enquiries and coordinate action should that be required. It is our intention to try and form the group from parents of children at the village playgroup, village school, local secondary schools and colleges as well seeking the opinions of young people themselves. The organisation is interested in attracting members for their opinions and will not necessarily require regular attendance at meetings or a large time commitment, allowing individuals to become members and contribute as and when they feel they need to, or have time available. We are proposing the formation of a small to medium sized Management committee made up of village parents and other interested parties and then opening any meetings to all who wish to attend, including grandparents, guardians and carers, as well as anyone who has an interest in safeguarding the future interests of our children. If members cannot attend in person details of meetings will be circulated by e-mail.